The small, oval leaf below the true leaves is the tomato cotyledon. If you start seeds indoors, you’ve probably read the phrase, “when the seedling has a set of true leaves….” or something to that effect. What are true leaves? When a seed germinates, it bursts out of its seed coat and sends up a stem. Some of these stems have one leaf (called a monocot) others have two leaves on it (called a dicot). Tomatoes, for example, are dicots, while corn is a monocot. Cotyledons are part of the seed and, on many plants, they provide photosynthesis as the plant grows. A bit later, a plant will form its first “true leaves.” These leaves have the appearance and function that all future leaves will have, and they may look dramatically different than the cotyledons. 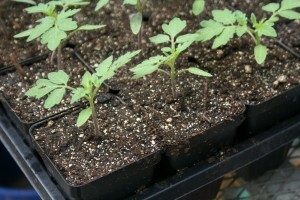 For seed starters, it’s important to remember not to transplant seedlings until they have some true leaves. Here’s a short video from the University of Illinois Extension Service on the difference between ctyledons and true leaves.